Why seven? The Greeks thought that the number had mystical significance. Perhaps because it was the total of the known planets (Mercury, Venus, Mars, Jupiter, Saturn) along with the Sun and Moon. Since the it was Greeks who made the lists it is not unusal that many of the items on them were examples of Greek culture. The writers might have listed the Stonehenge if they'd seen it, but this placs was beyond the limits of their world. So pack your bags and start this impossible tour through time and space. Some of the pages have 3D images, so if you're not familiar with how to view them, click here to visit our 3D page before you start. The Seven Wonders of the Ancient World isn't the only list of marvels people have created. In 1994 the American Society of Civil Engineers (ASCE) decided to put together a list of the most remarkable civil engineering feats of the 20th century. This list is often referred to as The Seven Wonders of the Modern World and you can visit them by going to our Modern World Wonders page. In 1997 the Cable News Network (CNN) put togeather a list of ecological wonders. To visit these locations go to our Seven Wonders of the Natural World page. 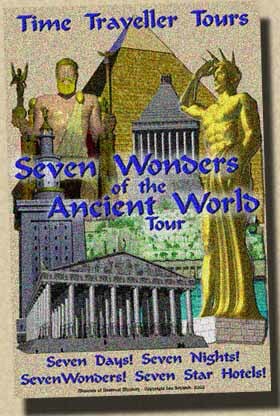 Book: Seven Wonders of the Ancient World.